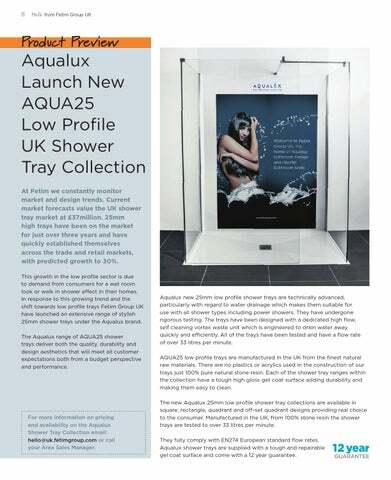 Aqualux Launch New AQUA25 Low Profile UK Shower Tray Collection At Fetim we constantly monitor market and design trends. Current market forecasts value the UK shower tray market at ÂŁ37million. 25mm high trays have been on the market for just over three years and have quickly established themselves across the trade and retail markets, with predicted growth to 30%. This growth in the low profile sector is due to demand from consumers for a wet room look or walk in shower effect in their homes. In response to this growing trend and the shift towards low profile trays Fetim Group UK have launched an extensive range of stylish 25mm shower trays under the Aqualux brand. The Aqualux range of AQUA25 shower trays deliver both the quality, durability and design aesthetics that will meet all customer expectations both from a budget perspective and performance. For more information on pricing and availability on the Aqualux Shower Tray Collection email: hello@uk.fetimgroup.com or call your Area Sales Manager. Aqualux new 25mm low profile shower trays are technically advanced, particularly with regard to water drainage which makes them suitable for use with all shower types including power showers. They have undergone rigorous testing. The trays have been designed with a dedicated high flow, self cleaning vortex waste unit which is engineered to drain water away quickly and efficiently. All of the trays have been tested and have a flow rate of over 33 litres per minute. AQUA25 low profile trays are manufactured in the UK from the finest natural raw materials. There are no plastics or acrylics used in the construction of our trays just 100% pure natural stone resin. Each of the shower tray ranges within the collection have a tough high gloss get coat surface adding durability and making them easy to clean. The new Aqualux 25mm low profile shower tray collections are available in square, rectangle, quadrant and off-set quadrant designs providing real choice to the consumer. Manufactured in the UK, from 100% stone resin the shower trays are tested to over 33 litres per minute. They fully comply with EN274 European standard flow rates. Aqualux shower trays are supplied with a tough and repairable gel coat surface and come with a 12 year guarantee.